PING is a company that got started the same way that so many of today’s classic all-American sagas do. It began with one man, Karsten Solheim, a Norwegian-born immigrant who came to America and loved the game of golf. He began tinkering with golf clubs in his garage and trying different things to see how he could make his clubs better. Eventually, his custom creations became quite a hit — and PING was born. For nearly fifty years, Karsten designed clubs that were both popular for amateurs and successful for tour professionals. He has been inducted into the World Golf Hall of Fame. 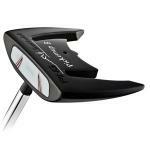 In fact, the Anser putter (which dates back to 1966) remains the most successful putter design to date. Today, production headquarters are based in Phoenix, AZ. Since Karsten’s passing in 2000, his sons John K. and John A. Solheim have kept the business as family-run. The eldest, John K., heads up the product development department while John A., who worked for PING since he was 15 years old, is now the company’s CEO. “Improving a product’s performance through innovation and quality” is the intended goal for any PING club. And these days, innovation has moved beyond garage tinkering to using 3D computer technology, all with the same attention to detail that Karsten was so well known for. One of the company’s claims to fame, beyond its highly successful Anser putter and irons, is that it’s the first company to be ISO-9000 and 14000 certified. Engineers at PING have developed a system for customizing each of their golf clubs to a golfer’s swing. This is what they call “club fitting.” PING uses a color-coded chart that aims to match up the physics of a golf club to the swing style and swing results. It’s a fairly new development over the past 10 years or so, and those who have tried it acknowledge PING as the leader in their field for customization. In fact, their color-coding system is even PGA certified for training programs. 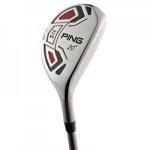 Getting a PING custom club can be completed online or in person with a licensed representative. Steps to customization include Static Fitting, a Dynamic Swing Test, and Ball Flight Analysis. In PING drivers and fairway woods, you’ll find Straight Flight Technology. This means 10% of the weight of the club is towards the heel. The way that it’s weighted helps it square off properly for a straight shot. 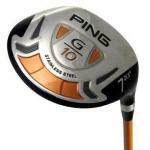 Check out a driver like the PING G10 which is recommended for all levels of golfers. 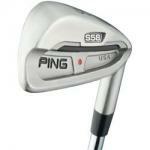 Today’s PING hybrids have seen many advancements as well. They are the longest they’ve ever been thanks to an internal toe pad that expands the perimeter weight. 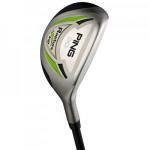 There are many, many PING iron clubs to choose from. You’ll see a wide variety of options for trajectory height, forgiveness, club size, topline thickness, and offset size. And yes, PING still makes the Anser, which is the company’s first forged iron club design. If you like, you can find traditionally-styled golf clubs that still hold up to today’s technology, like the Ping Zing Irons. PING wedges are popular among Tour pros. The Tour-S comes in stainless steel or “Rustique” 8620 steel that fades and tarnishes naturally over time. This club has seen many professional wins, and it’s styled for maximum control with a low offset and medium trajectory. Another great model is the milled wedge in the Tour 52 series. 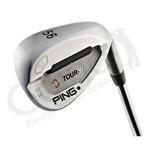 Putters coming from PING’s lineup are extremely popular as well as very technologically advanced. You’ll find inserts galore with alignment aids that are very easy to see. There’s something for everyone, from futuristic non-traditional putters to traditional blade putters. A stand-out feature is “Optigraphic Alignment.” This is an optional, built-in flange with a thick white line on top, making the alignment much more easy to see. This is a good-looking Ping Tour wedge that has an even better looking price. This Tour wedge is designed for you "sticks" out there that can appreciate the feel and playability of a milled face. Tour player Lee Westwood carries Ping Tour wedges in his bag.